The OHSAS 18001 Occupational Health And Safety Certificate is the internationally recognised assessment specification for occupational health and safety management systems. It was developed by a selection of leading trade bodies, international standards and certification bodies to address a gap where no third-party certifiable international standard exists. This certification has only been achieved by less than 1% of UK businesses and this prestigious award is supported by the Government and recognised world-wide. 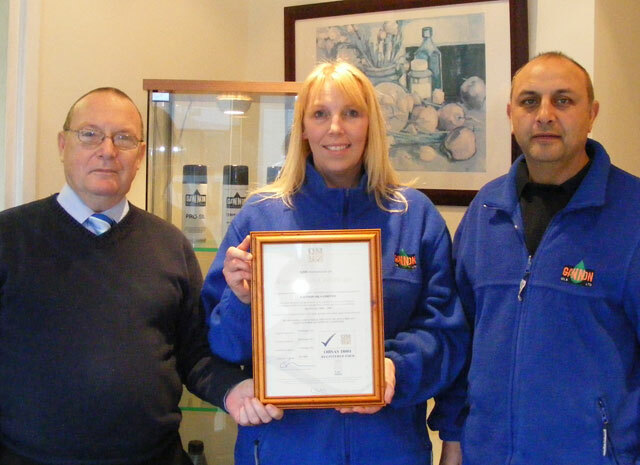 This accrediation adds to Gannon Oils' existing accreditations of ISO 9001:2008 (Quality Management) and ISO 14001 (Environmental Management). Said a delighted Managing Director Mark Gannon "We have always been proud of the service we offer our clients and the way that we conduct our business including the importance we give to Occupational Health & Safety matters. Now with the award of BS OHSAS 18001 certification, this has been confirmed by outside experts who are used to judging standards on a daily basis in a wide variety of trades and industries." Tom Graham, who undertook the assessment for QMS International plc, paid particular tribute to "the investment in people and training that enables Gannon Oils to provide an efficient and Occupational Health & Safety aware service to their customers."